I was born and raised in Seattle, WA and began working with clay at High School in 1968. I went to the University of Washington to work with Robert Sperry, Patti Warashina and Howard Kottler. Receiving my BFA in 1975, I proceeded to set up my studio in the Seattle area. Over the years I’ve taught at the University of Washington and Everett Community College and have given numerous workshops. I currently teach at Shoreline Community College. I have been a ceramic artist in Seattle since 1968 and have worked predominately in porcelain on the potter’s wheel. My forms are defined by functional simplicity and the white surface of each piece is decorated with abstract brushwork in blues, browns and grays. 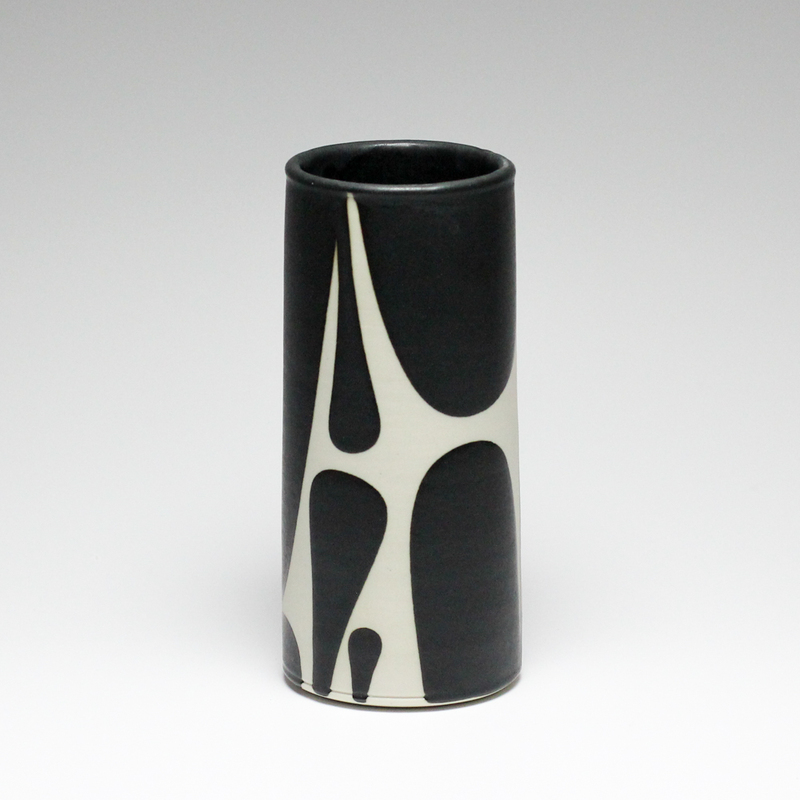 I also utilize the contrast of the white porcelain surface with a black matte glaze. The development of this glaze has allowed me to employ new forms of decoration on the clay surface, juxtaposing biomorphic poured shapes in contrast to the dense white porcelain. These drips create a graphic tension that is enhanced by orienting the directional flow of the glaze from both rim and foot of the piece. The shape of the pot informs the pouring process creating overlapping patterns which integrate the form, surface, and decoration, unifying the overall design. More recently I have been exploring my interest in science and technology and their impact on society, in a series of plates. Impressions of various objects are made in the soft clay, becoming contemporary fossils. The contents of each plate are meant to “serve up” commentaries or provoke observations of the ideas, decisions, and developments that impact our actions and leave an “impression” on our society. My goal is to blend technique and intuition in both form and surface treatment, while working in the vessel format.